What sort of painting is this? As in other portraits by the American Thomas Eakins (1844-1916) and many others since the Renaissance the principal subject is seated and painted nearly life-size, gazing out of the picture as a secondary figure hovers in the background. But several elements here seem odd. The frame’s wide gilded planks support a host of esoteric mathematical formulas and rough diagrams better suited for the blackboard of a college classroom than the walls of an art museum. The object in the sitter’s hand seems almost to have come from science fiction: an inexplicable rectangle with an incongruous range of colors contrasting dramatically with the reserved, narrow palette of the rest of the canvas. And then there is the signature on the floor below the chair of the sitter: Henry A. Rowland. Rowland was one of the greatest scientists of the 19th century. Born in 1848 in Pennsylvania to a Presbyterian clergyman (himself the son and grandson of distinguished Congregational ministers), he studied civil engineering in college and worked briefly as a railway surveyor. 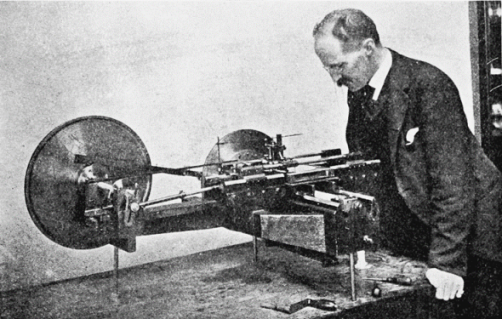 But Rowland quickly determined that his true calling was to do experimental physical research in physics. The newly formed Johns Hopkins University recruited him in 1875 to lead its physics department; he was 27 and had yet to receive his PhD. The university’s prescience paid off; in his new laboratory in Baltimore Rowland made a series of seminal discoveries in electromagnetic theory and practice. This painting memorializes his greatest accomplishment: the invention of a system to allow highly precise measurement of the full range of sunlight’s spectrum. Rowland found a way to precisely etch reflective metal plates to make diffraction gratings with over 10,000 parallel and equidistant lines per inch. To make each grating the ruling engine, seen behind him in the painting, ran a diamond-tipped stylus over a metal blank 24 hours a day for five to six days. When pointed correctly to the sun a grating like the one Rowland holds offered dramatically better resolution (and therefore far more detailed and systematic analysis of how light works) than previous systems ever could. The invention effectively created the field of modern spectroscopy (the study of the interaction between matter on the one hand and light or other wavelengths on the other). Rowland chose the formulas on the frame as shorthand for his brilliant breakthrough in mankind’s physical understanding of light. The achievement was not only intellectual, but also practical. The sitter’s muscular right hand (as well-lit as his head) and the presence at the lathe of Rowland’s longtime assistant, Theodore Schneider, each remind us that the ruling engine was smelly, noisy and required tending. 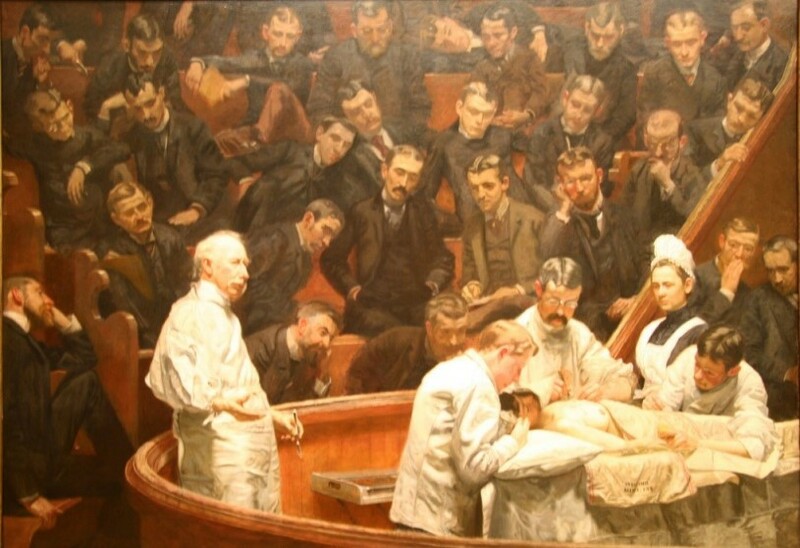 Eakins’ two most celebrated works also show the messy practice of great science: The Gross Clinic (1875) and The Agnew Clinic (1889). 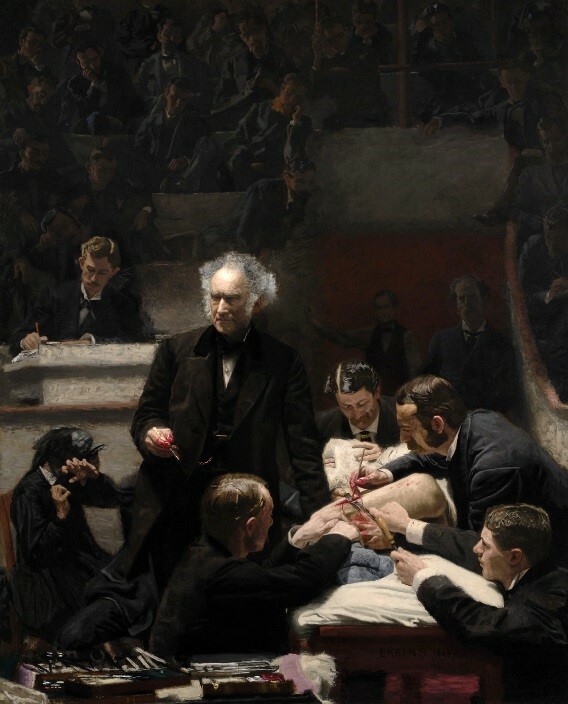 Each is a portrait of a Philadelphia surgeon surrounded by medical students observing their work intently within crowded medical amphitheaters. Here, as in the earlier two works, the central figure shows both insightful mind and active hand. Eakins is proclaiming the complementarity of contemplative intellect and vigorous practical engagement. But he distills the Rowland composition to the hero plus a single companion, with their work also distilled to a rectangular window into the mysteries of the universe. Rowland and Eakins, both skeptics, stood in fascinated awe before the powerful but opaque laws of science, what Rowland called “the problems which tax our minds to the limit of their capacity and suggest the grandest and noblest ideas of which they are capable.” Eakins’ own passion to understand human anatomy paralleled Rowland’s ardent pursuit of the constants undergirding the physical world. The painting therefore expresses both the complementarity of head and hand and that of heart, as Rowland, Eakins, and all of us yearn to glimpse the Grand Design. After all it was Galileo who wrote that “the glory and greatness of Almighty God are marvelously discerned in all his works and divinely read in the open book of heaven.” Man revealed the brilliant colors of the grating held by Galileo’s intellectual heir – but God made them. They reflect the wonders of a creation which invites our inquiring minds and able hands – and our humble hearts – as we, too, seek to read the open book of heaven. 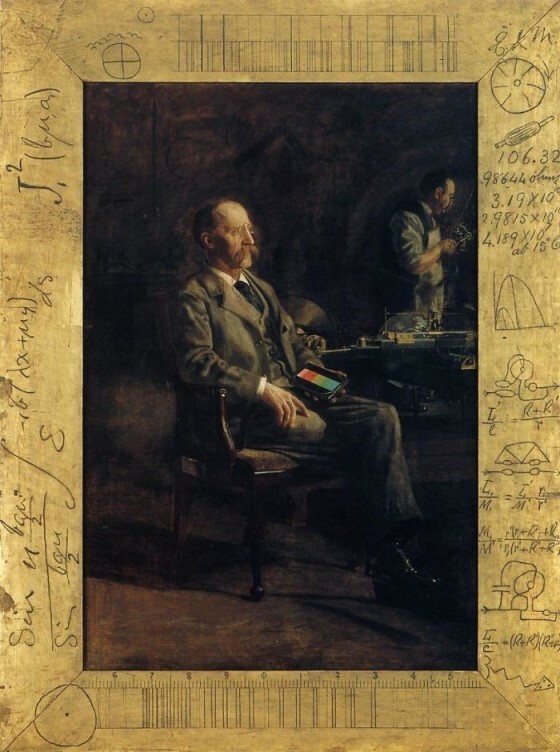 Thomas C. Eakins: Professor Henry A. Rowland, 1897, oil on canvas, 203.84 x 137.16 cm. Addison Gallery of American Art, Andover, Massachusetts, USA. Thomas C. Eakins (1844–1916) is best known for his portraits and his scenes of athletes such as boxers and oarsmen. With unflinching attention to the psychological makeup of each sitter his work is distinctively American and the antithesis of the flattering portraits such as those painted by John Singer Sargent (1856-1925). Like Rowland he was also a teacher (in Eakins’ case at the Pennsylvania Academy of Fine Arts where, in 1882, within four years of becoming a professor, he was named Director). Unlike Rowland, however, in 1886 Eakins was compelled to resign after several drawing classes whose attention to anatomical accuracy offended contemporary sensibilities, e.g. removing a male model’s loincloth in the presence of female students. He went on to teach at a variety of other institutions in his native Philadelphia, in New York and in Washington, before devoting himself full-time to painting from 1898 until his death.